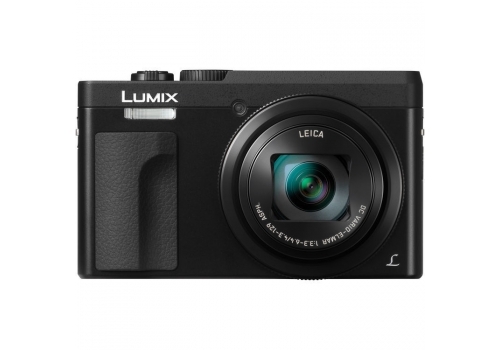 A pocketable multimedia powerhouse, the black Lumix DC-TZ90 Digital Camera from Panasonic blends a sleek form factor with versatile stills and video capabilities. Revolving around a 20.3MP 1/2.3" High-Sensitivity Live MOS sensor, the TZ90 realizes rich image quality with low noise and sensitivity to an extended ISO 6400 for working in difficult lighting conditions. The sensor and image processor also enable shooting continuously at up to 10 fps with single-shot AF, 30 fps at 8MP in 4K Photo Modes, and UHD 4K video recording at 30p. The 4K capabilities also permit working with unique Post Focus technology for choosing a specific point of focus after shooting. Beyond the imaging abilities, the TZ90 is also characterized by its impressive 30x Leica DC Vario-Elmar zoom lens, which covers a 24-720mm equivalent focal length range, as well as 5-axis HYBRID O.I.S. to minimize the appearance of camera shake for sharper handheld shooting. Also notable is the camera's compact size and incorporation of both a 1.166m-dot electronic viewfinder and 3.0" 1.04m-dot tilting touchscreen LCD. Additionally, built-in Wi-Fi allows you to wirelessly share imagery or remotely control the camera from a linked smartphone or tablet.